This clock was perhaps the last developed that employed a simple key with a lug to depress a tumbler and thereby emboss or prick a dial. Generally, such a system suffers from the basic weakness that it is not difficult to make a counterfeit station key that will depress the tumbler as well as the legitimate key will. In the Spartan, however, it was quite difficult to make such a key that would certainly depress just the tumbler intended to be depressed. The Spartan was produced in two regular sizes, 16-station and 24- station, and in later years a "Special" 30-station size. Both Waltham and Elgin stem-wind movements were used (of an automobile dashboard size and type). 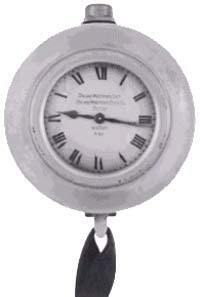 In the Spartan's last years during the 1950's, the Detex Watchclock Corporation movement was used. Detex Corporation purchased all the assets of the Chicago Watchclock organization in 1958. Service for existing customers, with a few sales of new systems, was continued until about 1970. The Minute Man, Chicago's equivalent of the Detex Newman, and the Comet, its equivalent of the Detex Eco, were discontinued earlier.